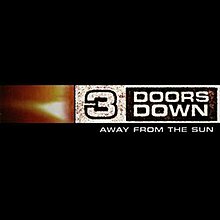 Away from the Sun is the second studio album recorded by American rock band 3 Doors Down, It was released by Universal Records on November 12, 2002 (see 2002 in music). The singles released for the album were as follows: "When I'm Gone", "The Road I'm On", "Here Without You", and "Away from the Sun". The recording sessions took place during the summer of 2002 with Producer/Engineer Rick Parashar at London Bridge Studio, in Seattle, Washington. Rush guitarist Alex Lifeson performed live with the band during their premiere party in Biloxi for Away from the Sun. The album has sold eight million copies worldwide, including well over four million in the US alone. This album was included among a group of 15 DualDisc releases that were test marketed in two cities: Boston and Seattle. The test market DualDisc version of the album is rare. In 2005 the DualDisc version was reissued in a more widely distributed version. The original test market version differs from this common version in both packaging elements and in the design of the back of the inlay card. The DualDisc has the standard CD album on one side, and a DVD-audio/DVD-video on the second side. The DVD-audio portion contains the entire album in advanced resolution 5.1 PCM surround sound and 2.0 PCM stereo. The PCM audio was recorded at 96 kHz and 24bit for both audio tracks, but the 5.1 audio track is at 13,824kbit/s and the 2.0 audio track is at 4,608kbit/s. Special features for the DVD-audio include the band's biography, a photo gallery and lyrics for the listed tracks only (not for the hidden track 'This Time'). The DVD-video portion contains the entire album in 5.1 Dolby Digital surround sound and 2.0 Dolby Digital stereo. The DVD side also features the music video for the song 'The Road I'm On' directed by The Malloys. All songs written by 3 Doors Down, except "Dangerous Game" and "Sarah Yellin" by Arnold, Roberts and Harrell. 6. "The Making Of Away From The Sun"
The song "When I'm Gone" has two versions of the video. The song "When I'm Gone" was featured in the video game Band Hero in 2009. Both it and "Here Without You" were featured as downloadable content for the video game Rock Band in 2011. ^ "Music Albums, Top 200 Albums & Music Album Charts". Billboard.com. 2009-12-31. Retrieved 2012-01-15. This page was last edited on 13 April 2019, at 17:45 (UTC).